The Nice bus system is fairly extensive as it connects all parts of town as well as the outskirts. (See a bus map) Buses are modern, air-conditioned and fairly comfortable as far as buses go. Yes, they can be quite crowded but the special bus lanes on major streets means they can get you to your destination much faster than a car especially during rush hours. Convenient as it is, the buses don't hold a candle to the tramway for journeys between the Old Town and north Nice. The tram is more frequent and runs longer hours. More. IMPORTANT NOTE: The Nice bus system will be totally overhauled on 2 September 2019. Few of the previous routes will be maintained. The new network will revolve around Nice tramways, particularly Ligne 2, the east-west route. There will be far fewer buses so as not to duplicate the tram route but the remaining buses will be more frequent. The new lines 5, 6, 7, 8 will run from 5am until until 1am. The Noctambus will no longer exist. **Other lines will also be replaced; details are not yet available. Bus service starts early (around 5 or 6am) but for a major city, the buses in Nice start to peter out unusually early, around 9 or 9.30pm or so, depending on the bus and the station. Frequency varies according to the route but is generally every 10 to 20 minutes. Buses are more frequent on weekdays and substantially less frequent on Sundays. At 9.10pm the night buses or Noctambus start which is a system of five separate lines running from the town center to various destinations in town. Service ends at 1.10am. Noctambuses are indicated by the "N" before the number: N1, N2, N3, N4, N5. Buses run every hour on weekdays and every half hour on weekends. Not every bus stop is served by a Noctambus. It's advisable to check the schedule before heading out. Note that the Noctambus will cease operations the 2 September 2019 (see above). Airport buses will cease operations 2 September 2019 as the east-west tramway will make the service redundant. As of now, Tram Line 2 runs from Airport Terminals 1 and 2 to Magnan for a price of €1.50. In June 2019 it will run as far as av Jean Medecin. More about Nice tramways. Airport bus 99 runs from Terminal 1 east to the train station. 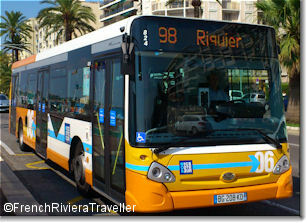 Airport bus 98 runs from Terminal 1 east along the Promenade des Anglais to the Promenade des Arts/Lycée Masséna. The price is €6. From the airport, buy tickets at the marked ticket office. To the airport, buy tickets from the driver. As of 2 September 2019 both airport buses will cease operations to be replaced by tramway line 2. Local bus line 23 runs from the Airport/Promenade stop on the Promenade des Anglais in front of Terminal 1 to Nice Nord along the Promenade des Anglais. The price is €1.50 if purchased from the driver. The price of a single ticket is €1.50 and you can buy it on board directly from the driver. The ticket is good for all transfers that take place within 74 minutes but is not good for a return trip. Do as locals do and buy a 10-ride multi-voyage card for €10. There is no expiration date and it can be used for group travel. As in the single-ticket, the card is good for transfers in the same direction for 74 minutes. The card must be validated for each transfer. There's also a daily pass for €5 which is economical if you'll be doing a lot of sightseeing. You can buy this pass from the bus driver or at the machine at any tram stop. To use the daily pass, stamp it in the validatating machine onboard your first trip. After that, you're good to go. The seven-day pass for €15 is another option if you need to take a number of buses throughout your stay. This pass is only on sale at a Lignes d'Azur agency which you'll find at the train station, Place Masséna and a number of other locations. Going to or from Nice airport? Get a pass aero for €6 which includes a bus to or from the airport bus plus the bus to the airport which costs €6. Buy this ticket from a Lignes d'Azur agency or at the airport or aboard an airport bus. 3. You may buy a bus ticket from the driver. Bus drivers can give change for tickets purchased aboard. 4. You must insert your ticket into the validating machine to be stamped even if your ride is a transfer. There are occasional checks and you will be levied an on-the-spot fine for not having a ticket or not having a validated ticket. 5. You may ask the bus driver to let you know when you arrive at your desired stop but only if the bus is not crowded with passengers. Otherwise, consult the list of stops in the bus or keep an eye on the sign at each bus stop. 6. Before you reach the stop, you (or someone else) must press the red button fixed to poles so that an Arret Demandé flashes in red overhead the driver. Your first stop should be the Lignes d'Azur website. Just plug in the addresses of your departure and arrival points and you'll get a precise timetable. Also important are the up-to-the-minute notifcation of service disruptions. Disruptions and detours are frequent because of strikes, construction work, demonstrations and the many events that take place in central Nice. Lignes d'Azur has a telephone service in which you can find out exactly which bus or buses to take where and at exactly what time the bus arrives at your stop. No kidding. Just call 08 1006 1006 (€.06 per minute). Operators can communicate in English. Lignes d'Azur has apps for iPhone and Android. The geo-location feature is most helpful if you don't know your nearest stop. Be aware that the app tells you when the bus is supposed to arrive. It is not unusual for a bus to arrive ahead of schedule. A new app, Zenbus, is in development and will tell you exactly where your bus is and when it will arrive. Obviously, to take advantage you'll need wifi or a data connection. See more on cellphones on the French Riviera. At the bus stop you can get the schedule for arriving buses via SMS. 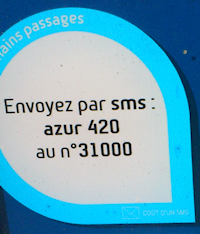 Send the number of the bus stop to 31000. The number is at every bus stop (see photo left). There is also a scannable bar code at each bus stop, compatible with Flashcode, that gives bus schedules. It's worthwhile to download the Flashcode app for iPhone or Android.